Admin's Note: This is an archive article that has been moved over from our old site. Author and photographer credits are unknown. Originally published in 1998. Original author unknown. When new recruits join the VC SAR Dive Team, the team takes the opportunity to go to Santa Barbara City College (SBCC) and give all members a chance to try hardhat diving. 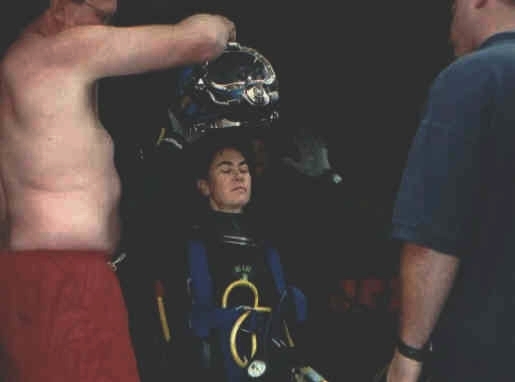 In the SBCC Marine Diving Technologies program, run by Mike Von Alvenslaben, the team experienced activities such as diving the Kirby Morgan Superlite helmets and acting as surface tenders for divers in the well. Responsibilities for surface tenders included monitoring divers' air supply and hardwire communications. On two occasions, the Sheriff's Department sponsored small groups of VC SAR dive team members to go though the "Advanced Dive Rescue for Law Enforcement and Public Safety Divers" class (MDT 178), that gives a national certification upon successful completion. 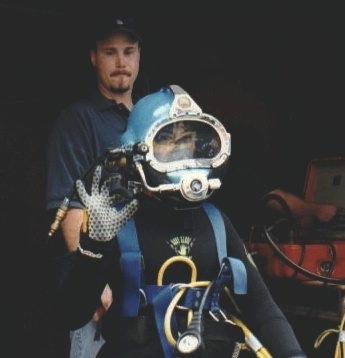 The California Office of Emergency Services (OES), encourages teams in each county to have qualified individuals with hardhat diving expertise who can be called upon to respond wherever needed, in the event of a disaster. It is important to note, however, that in addition to certification, to stay proficient and qualified to respond, these divers must log many hours of hardhat diving and they must practice the skills learned in MDT 178. This link shows a team diver going through the introductory program. (The training session featured in this took place in 1998, Mike has since retired). Dominique waits for the final phase of gear up before entering the diving well at Santa Barbara City College. Surface-to-diver communication equipment can be seen in the background (orange box). Tenders constantly monitor divers underwater using hardline communication. Dom gives the "OK" sign to signal her tender that she's ready to enter the well. Jim acts as tender and guides Dom to the diving well making sure to keep the lines clear of obstructions. Inside the 55-gallon drum is a pipe puzzle the diver must put together with a large crescent wrench. The puzzle must be completed before the diver's exhaust bubbles fill the drum enough to rise it to the surface. In this exercise, the diver's faceplate is blacked out with duct tape. The diver must tie four knots, a bowline, figure eight, sheet bend and square knot onto the bar by feel alone. After the exercises are completed, Wes leads Dom back to the surface station where she can get out of her gear and pass it on to the next diver. Once out of the water, it was a relief to get the helmet off. Superlites are really not very light!